I know that I will miss so many things about these early years of motherhood but this I know: I won’t miss the whining. A couple of weeks ago, we had a library whining situation. The afternoon had started off nicely, so this whining situation was unexpected. The library was essentially empty, and all three of my kids were content. They were happily – and quietly– filling their bags with books. I thought it would be the perfect time to get T, who is now a rock star reader, her very first library card. It’s funny how perfectly calm afternoons can turn into chaos in a moment. That’s just what happened. T, overjoyed at this news, announced the plan to her brothers. Seuss had a quick intake of breath and then proceeded to jump for joy with his sister. Leo, however, was not impressed. “Where is my library card?” he inquired. 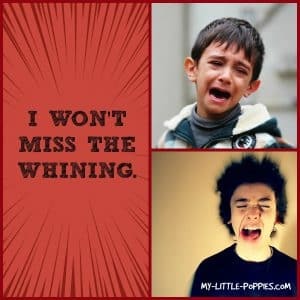 Enter the whining. I will miss many things when I look back on these early years of motherhood but I am quite certain that I will not miss the whining. T and I did our best to ignore it while filling out the necessary paperwork. T was beaming and I smiled back. This was a big day. I can vividly recall the day I got my first library card. I told her about that day, and then I told her about the day we took Leo to get his first library card. “But MY library card is miiiiiiiiiiisssing,” he bemoaned, falling dramatically to the floor. “Congratulations, T!” the librarian said as she handed T her library card. In an instant, Leo was on his feet and in T’s personal space, examining the new card. “That library card is NEW. It has a NEW DESIGN. It looks WAY BETTER than my card. My card that is MISSING!” he exploded. “–WITH AN OLD DESIGN! YOU HAVE AN OLD ONE! IT’S NOT FAIR!” He fell to the floor once more. Clearly, this was our cue to vacate the premises. “C’mon guys, let’s go home” I said, stepping over my almost 7-year-old. Seuss marched up ahead with T in his wake. She had her new card in her palm and she was beaming. It was clear from her face that she was not letting her brother’s shenanigans rain on her parade and for that I was grateful. I let the younger two walk a bit ahead of me while I waited for Leo, who was now stubbornly crawling toward us. When they reached the library foyer, Seuss and T could see an elderly woman, arms loaded with books, attempting to open the door. Seuss quickened his pace and opened the door, holding it open for her like a little gentleman. My heart swelled for we have talked about doing this before but this is the first time I witnessed him independently hold the door for a stranger in need. “Oh my!” the woman smiled. “What a helper you are!” As she said these words, a bookmark fluttered from her arms to the floor. T scooped it up and handed it to the woman with a smile. I thanked her and then added, “You might change your mind in a second.” The woman looked puzzled for a second until she noticed the almost seven-year-old slowly approaching. He was now doing some sort of Quasimodo routine, all hunched over, feet dragging. And he was still whining. You know what? I bet she doesn’t miss the whining, folks. Tell me… do you have “one”? Will you miss the whining when this season of motherhood has passed? Share your stories here. If you can’t change it, change the way you think about it. Don’t complain. He’s 10, almost 11. The whining is going to kill me, I swear. ROFL! Oh, man! I could not stop laughing. Yep, this is my son – he whines, debates, whines, tries to one up, does a dramatic dance of chaos, arches his back, and falls to the floor. But, he can miraculously become calm in an instant, IF it benefits him or something exciting is happening. I have tried taking pictures of him when he whines (as a deterrent), only for him to smile or run and hide. We have quietly joked about how he could win an Oscar for some of his whining performances. Dude, has this whining thing down! However, when they happen (especially in public) it is no fun. It’s also much worse when he his tired. It can take a long time to calm him down, because he becomes so fixated on what he is whining / upset about and will not go to sleep until we have a resolution or game plan. Hahaha…laughing so hard over here, in sympathy, of course. 😉 The whine rotates its way around all of us, and even hits me some days. I can just imagine Leo making his way across the library. May you have a whine-free or wine-full weekend! I know you get this 🙂 Thanks for laughing with me! I tell pH that when she whines she’s actually using a frequency that I can’t hear, so thus can’t respond to. She either hasn’t figured out the logical flaw in my argument or she’s ignoring it, but it does usually result in a lower pitched voice. But after weeks of no tantrums, we had one. Sigh. I don’t know how you’re doing three kids. My one drives me over the edge some days!